The recipe for this risotto comes from Tessa Kiros and her wonderful book Apples for Jam. I often feature recipes from Tessa and it is only because every recipe she writes is outstanding and very simple to prepare. My only problem is every time I prepare this risotto I never seem to make enough. I have been wanting to make fried risotto balls with the leftovers, however, this is well liked by all and we manage to finish off the entire pot every time. Doubling the recipe is highly recommended, or quadruple if you are planning to have leftovers (which is what I am going to do next time!). This recipe serves three. I titled it simple because you do not have to stand over the pot continually stirring and adding broth. You can just allow it to cook and stir occasionally. It is suggested to serve this with little cubes of mozzarella stirred through near the end. We have had it both ways, however, I prefer to leave it out. If you like stringy melted mozzarella by all means add it at the end of cooking, just before serving. For the broth, put the onion, carrot, celery, parsley and tomato in a pan with 5 cups of water. Add water and bring to a boil. Reduce the heat to low and simmer for 30 minutes, then turn down the heat as low as it will go and leave the pan over the heat. Heat the olive oil in a wide heavy bottomed pot. Sauté the onion and garlic over low-medium heat for 5 minutes, or until lightly golden. Stir in the chile flakes and risotto, and cook for another minute. Add half the tomato purée, half the basil and 1 1/2 cups of the hot broth. Reduce the heat to low and simmer 10 minutes. stirring now and then. Add the rest of the tomato purée and the remaining broth, and simmer for 10 minutes, or until the risotto is cooked (if it needs another few minutes or a little more liquid, just use hot water). Tessa recommends you remove the garlic cloves and throw them away. We keep them in and eat them! Stir in the Parmensan and remaining basil. Serve drizzled with olive oil and a good grating of black pepper and pass around the extra Parmesan. So beautiful! Lovely flavours…I will be making this very soon! Nice to hear from you Arthur. :) Thank you. can I come for dinner? LOL!! I totally would make this tonight if I didn’t already have a curry on the menu… love your recipes! Cheers! Well, you never know… if I am in the Seattle area I may look you up! LOL! That would be a buzz hey? This looks absolutely delicious. Do you know I’ve never made risotto, Seana?! I love risotto so much!!! this one sounds delicious! I made some fried risotto cakes from barefoot contessa that started with the uncooked rice, they were soo good! We never have leftovers either : ) Hope you’re doing well! Hi Anne. So nice to hear from you! I’ll look into the barefoot contessa recipe…sounds great. Thank you for letting me know. You must be getting close to adding one more to your brood. :) Also looks like you found a gorgeous house! Congratulations. I’ve never actually made risotto, but this recipe looks like one I can tackle! Thanks for sharing it. Have a lovely day! That looks so good! Chili, basil, cheese and flavors from the vegetables, such great flavor! I seriously wish you could make it for me. I still haven’t made risotto partly because I think I might start eating it every night. I order it in restaurants, but this is so so tempting. It’s just gorgeous. looks and sounds so yummy. no wonder leftovers are a challenge! Yum! I’m SO, so glad you posted this. Apples for jam is one of my favourite cookbooks (the honey cake! ), but I’ve never tried this risotto. Will definitely do so. Isn’t Tessa Kiros amazing – her recipes ALWAYS work so beautifully and she writes so evocatively. Pinning this to remember to try it later. Will prepare double – must have leftovers for risotto balls! Yes! Absolutely love her honey cake. Hmm…think I must make one now that you mentioned it. I have always thought Tessa wrote Apples for Jam for me! :) Hope you do make this and in the spirit of 1=2 the risotto balls too! This looks simple and beautiful. Perfect for this cool weather! Hi Seana. Guess what I’m giving as Christmas gifts this year. Tessa Kiros’ Apples For Jam. I’ve always loved that cookbook and just after your last Tessa post I happened across a new shipment of Apples For Jam at our local bookstore. It must be serendipity. Perhaps I should make the tomato risotto for dinner tonight. It looks divine. That’s so cool! This is the best Christmas present you can give. I have given Apples for Jam twice now as Christmas gifts and it is so lovely. Do make the risotto! You’ll love it. Anyway, this tomato risotto looks amazing. I would definitely leave out the mozzarella and be happy with parmesan. oh yea…bacon would be most delicious. Oven baked risotto eh? I’ll have to look into that…never heard of it before. Looking forward to your arancini post for sure. Okay…made my own version for dinner last night. It was a winner all around! It goes on the ‘make again’ list!! own version? do share please! and…ps I’m going to have to check out Apples for Jam! I love it when you find a cookbook and everything is worth making. Great recipe and leftover risotto cakes are also delicious. Like tomato soup I’ve never cooked a tomato risotto. I’m beginning to wonder if I’ve got something against toms!? No, I do cook tomato sauces fairly frequently. But I do need to diversify! Ha! I had to laugh at this. I have to admit I was thinking of you and your incredible arancini that I have yet to make! I will..it has been on the top of my list for weeks now! I love this recipe! It looks great! Gorgeous and I love that you don’t have to stand over the pot continuously, simple recipes like this are my favorites. Hopefully you are using your Apples for Jam as much as I have in the past several years! Honestly…some of the pages have become spattered and warped because of the use. :) This is truly a wonderful simple family recipe… Nice to hear from you! Thank you Sophie… nothing like a good home made risottos…I agree. What a lovely recipe. I definitely think you are right – double the recipe and make arancini balls stuffed with the mozzarella used in the recipe. They might be nice with a bit of saffron breading – it would highlight the tomato flavor. :-) Thank you for sharing. The book Apples for Jam sounds wonderful! I will keep my eyes peeled – one can never have too many great cookbooks. Enjoy your week. Oh Shanna…you are always so kind and full of wonderful comments. I appreciate your enthusiasm! Thank you so much. You enjoy your week too! :) “comment” soon! Thank you Serena. Your blog is beautiful….absolutely beautiful. :) thank you! what a great comment, made me smile. Loks so cozy, warming good. I think a double batch would be a great idea– I love leftovers! my fave pairing cheese for it is danish blue cheese! sounds like a great choice…danish blue cheese! Thank you for your kind comment…and for stopping by too. This looks like a lovely and tasty dish. I love its simplicity. Thank you for sharing. I look forward to trying it soon. Like you, I likely will leave out the mozzarella. Thank you for your kind comment! :) I do love simplicity too. It is the only way I manage to bring it all together at the table every night. What a lovely and simple preparation. This is very reminiscent of a dish that I love at one of our local food spots, and I’m keen to try this at home now that I’ve found this recipe! 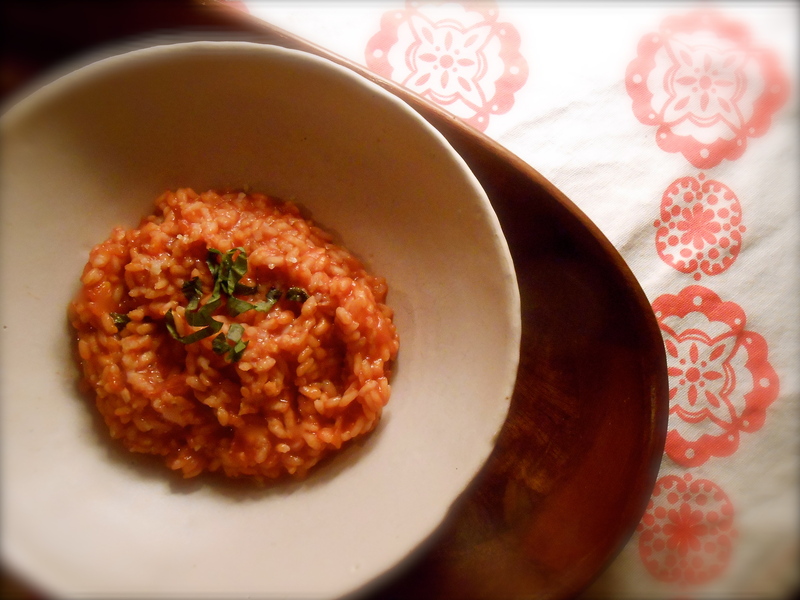 You are currently reading simple tomato risotto at COTTAGE GROVE HOUSE.